The headphone amp market in China, like its headphone market, is full of competition. Besides the bigger brands that have already made a name for themselves in the international market, there are still quite a few small companies and workshops that are highly regarded in the local market, yet remain relatively unknown to the outside world due to language barrier. 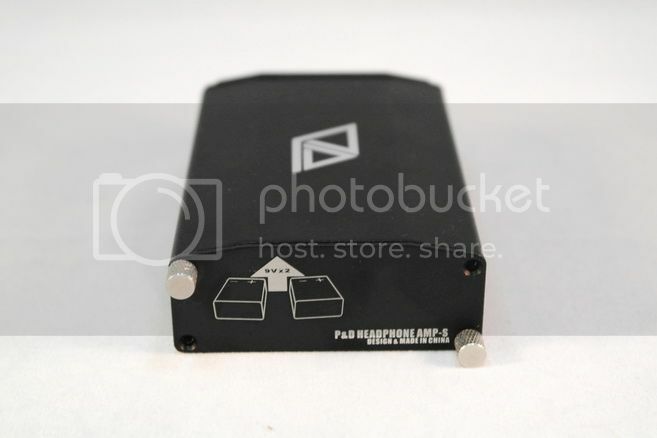 Panda Audio is one such company – found in 2006 as more or less a DIY workshop, the company has earned respect among the Chinese audiophiles for producing some of the best sounding portable headphone amps around. Here we take a look at their latest flagship – the amp-S. The amp is an early sample but it should be the same as the final retail version. Since it is a sample, it doesn’t come with any package and accessories so we are not going to cover those parts. 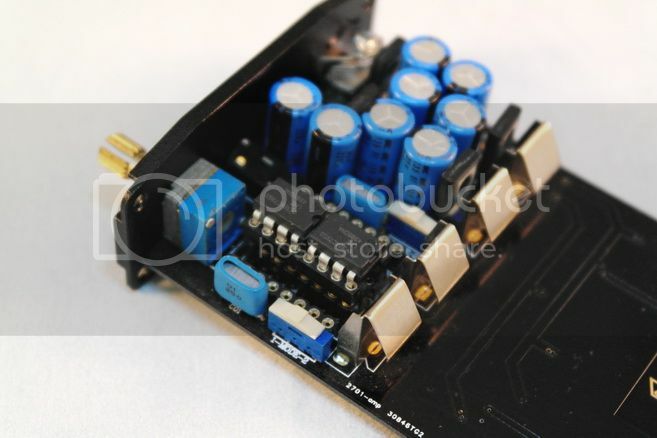 The build quality of the amp can pretty much be summed up as ‘bullet proof’. Though the design is not exactly fashionable, it is very solid and nothing really to compliant about. The amp is running on a pair of 9V to give it’s the 18V swing on the opamp. You can use rechargeable but you will need to find yourself a separate charger as the amp doesn’t take external power and isn’t rechargeable. One of the unusual parts is that the power LED is ultraviolet (*black light) and can double as a money checker. 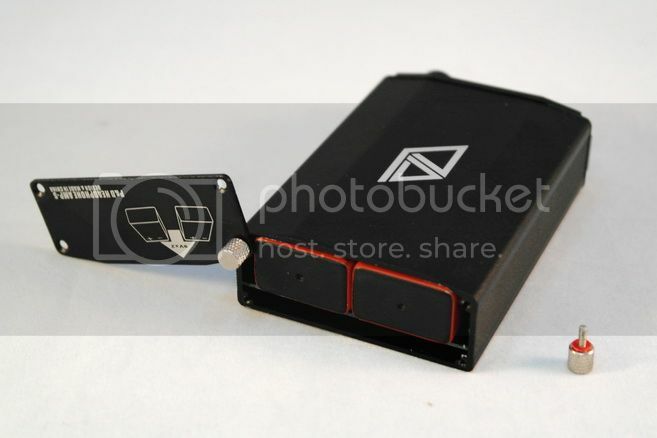 The amp-S has a fixed gain of +9.6dB. There is a very mild ‘pop’ during startup. It isn’t very loud but it is better to turn the amp on before plugging in any headphone. Hiss performance is quite good as the amp is total silence with the most sensitive IEM (Shure SE530 in this case) before the volume knob turns over 12 o’clock. Even after 12 o’clock, hiss remains fairly low. Given the relatively high fixed gain, any headphone that requires that much volume will not likely to be sensitive enough to pick up hiss. EMI performance unfortunately isn’t great and can get loud when receiving call. 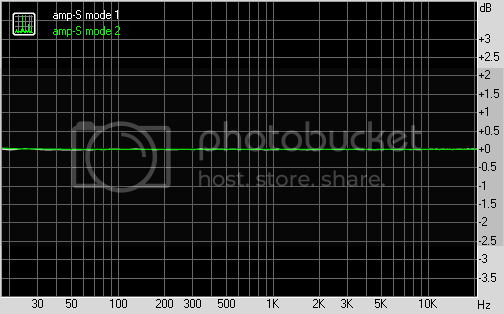 As usual, my sound quality evaluation started with some measurements. But before we go into the measurements, there are a few aspects of the amp we need to cover. The first thing is that the amp-S runs on two 9V batteries that give it an 18V swing (which I assume is split to +/-9V). It also has 2 dual channel (stereo) opamp in roll-able DIP8 configuration. In fact, you can either stick to two stereo opamp or use four single channel opamp of your choice (4 x OPA627 for an example). The second thing is that the amp-S, like its predecessor the amp-K Pro, has a unique-to-Pandaudio’s design – a user selectable feedback topology. You can either set it to run in either global feedback or zero global feedback configurations. The topic of global vs. zero global feedback is a bit too deep to cover, but the amp is set to run in global feedback by default and it does sound and measure better that way. Last but not least, the amp also has transistor buffer output stage. So how does the amp-S measure? Well, regardless of being in mode 1 or 2, the frequency response is flat from 20Hz to 20kHz. In the default mode 2, the RMAA result is quite good and almost comparable to the reference O2, except the IMD noise is slightly higher (0.059% to 0.024%). In mode 1, THD and IMD noise both increase significantly though far from being bad – around 0.2% and more comparable to the Elekit hybrid tube TU-HP01 that I recently measured. I never asked Pandaudio which mode is which but I assume mode 1 is zero global feedback as it is known that this kind of design will result in more noise. While noise does seem to increase by a lot from mode 2 to mode 1, the degree is so low that I actually didn’t notice any distortion in either mode. There is however very distinctive sonic difference between them and we’ll leave that discussion to the next paragraph. Output impedance is very low, measured and calculated to around 0.4 ohm. Current output is great, among the highest of any portable amp I have measured, likely thank to the transistor buffer stage. This means amp-S should behave quite well even with very low impedance load, though the relatively high fixed gain might not be the best for very sensitive IEM. 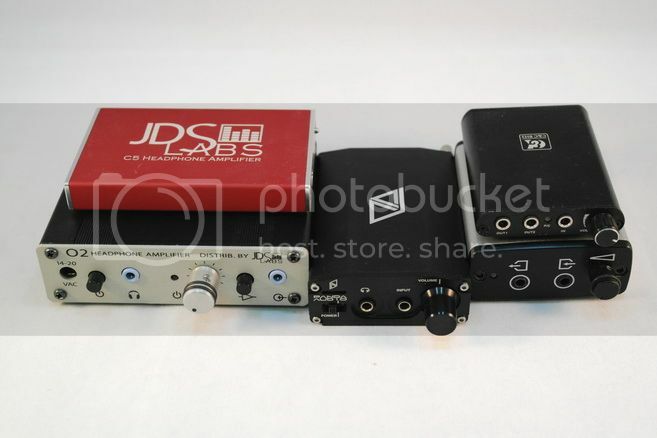 Size comparison (from left): JDS Labs O2, JDS Labs C5, amp-S, Meier Audio StepDance, C&C BH2. Subjective listening is mostly done on mode 2 as I find it to be the better of the two. The biggest difference between mode 1 and mode 2 is that mode 1 is smaller in soundstage and more forwarded, almost makes it sounds lush and musical. Mode 2 on the other is a lot wider and specious. Volume matched and compared to the reference O2, amp-S (in mode 2) is almost just as colorless as far as frequency distribution goes. The main difference is between the two is amp-S sounds a bit more laidback and specious. It can almost be said that amp-S has extra depth and deeper, better layering. The speciousness also makes amp-S sounds just a fraction slower in transient and appear a little more relaxing in the overall presentation. The difference however isn’t vast and probably hard to notice if you are not doing an A/Bing. Beyond that, amp-S can be described as another top-of-the-line sounding portable amp. Those who find O2 just a tad too aggressive will probably like the amp-S as it is almost a mellowed out O2 with comparable performance. Since amp-S is designed to be opamp roll-able, I took the opportunity to try out a few combos. Surprisingly MUSES02, which often excels in most amps, fails to impress. While it is decent sounding, it does fall short compared to the stock LME49860. The MUSES01 on the other hand sounds excellent on the amp-S and probably is the best sound opamp I tried – but it will only work on full battery and thus not a practical choice (as MUSES01 minimum voltage requirement is +/-9V). Other opamp also fail to impress, except for LME49720 with an exceptional 3D soundstage. However, I won’t say LME49720 has a clearly better sound than the stock LME49860. 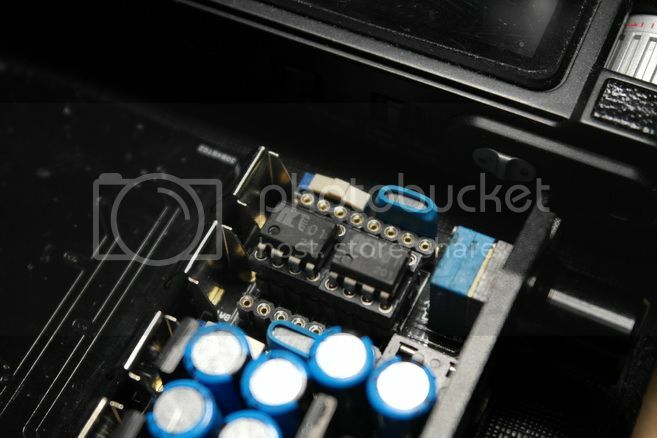 At the end I think sticking to the stock opamp is probably the best choice. MUESE01 in amp-S - great sounding, if only for a short while. So the rumor is confirmed – Pandaudio does make some of the best sounding amp, and not just for the Chinese but also for the world standard. The real shame is that this is not an easy amp to find. As far as I know, it is pretty much exclusive to those who live in China for now, unless you have a way to buy from Taobao and ship it oversea. 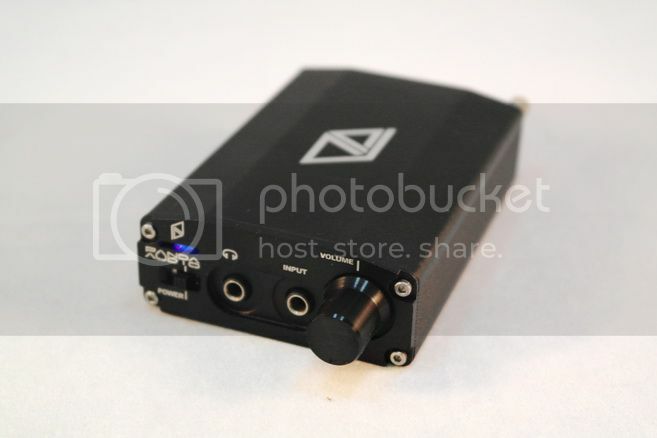 For those of you who are interested in distributing the Pandaudio’s products (they also make ultra-portable amp btw), just drop me an email and I can forward the contact detail to you. A thank to Panda Audio for the sample.